Ixtoc I was an exploratory oil well being drilled by the semi-submersible drilling rig Sedco 135 in the Bay of Campeche of the Gulf of Mexico, about 100 km (62 mi) northwest of Ciudad del Carmen, Campeche in waters 50 m (160 ft) deep. On 3 June 1979, the well suffered a blowout resulting in one of the largest oil spills in history. In modern rotary drilling, mud is circulated down the drill pipe and back up the well bore to the surface. The goal is to equalize the pressure through the shaft and to monitor the returning mud for gas. Without the counter-pressure provided by the circulating mud, the pressure in the formation allowed oil to fill the well column, blowing out the well. The oil caught fire, and Sedco 135 burned and collapsed into the sea. At the time of the accident Sedco 135 was drilling at a depth of about 3,600 metres (11,800 ft) below the seafloor. The day before Ixtoc suffered the blowout and resulting fire that caused her to sink, the drill bit hit a region of soft strata. Subsequently, the circulation of drilling mud was lost resulting in a loss of hydrostatic pressure. Rather than returning to the surface, the drilling mud was escaping into fractures that had formed in the rock at the bottom of the hole. Pemex officials decided to remove the bit, run the drill pipe back into the hole and pump materials down this open-ended drill pipe in an effort to seal off the fractures that were causing the loss of circulation. The drilling mud was followed by a large quantity of oil and gas at an increasing flow rate. The oil and gas fumes exploded on contact with the operating pump motors, starting a fire which led to the collapse of the Sedco 135 drilling tower. The collapse caused damage to underlying well structures. The damage to the well structures led to the release of significant quantities of oil into the Gulf. Prevailing currents carried the oil towards the Texas coastline. The US government had two months to prepare booms to protect major inlets. Pemex spent $100 million to clean up the spill and avoided most compensation claims by asserting sovereign immunity as a state-run company. The oil on Mexican beaches that the authors observed in early September was calculated to be about 6000 metric tons. Based on reports from various groups and individuals, five times that figure is thought to represent a fair estimate of what had landed on Mexican beaches. Investigations along the Texas coast show that approximately 4000 metric tons of oil or less than 1 percent was deposited there. The rest of the oil, about 120,000 metric tons or 25 percent, sank to the bottom of the Gulf. The oil had a severe impact on the littoral crab and mollusk fauna of the beaches which were contaminated. The populations of crabs, e.g. the ghost crab Ocypode quadrata, were almost totally eliminated over a wide area. The crab populations on coral islands along the coast were also reduced to only a few percent of normal about nine months after the spill. One study found that the most persistent issues were pollution of estuaries and coastal lagoons lining the bay, and especially the effects on breeding and growth of several food fish species. Fishing was banned or restricted by Mexican authorities in contaminated areas north and south of the well. Fish and octopus catches dropped by 50 to 70% from the 1978 levels. Some larger species with longer life spans took years to recover from the Ixtoc spill. It wasn't until the late-1980s that the population of Kemp's Ridley turtles, which lay a couple of hundred eggs a year, as opposed to the millions produced by shrimp, started recovering. The immediate losses from an oil spill continue to affect larger species for generations. There is much less information on the impact of the Ixtoc I spill on benthic species (bottom dwellers). The best studies were on the Texas coast over 1000 km from the spill. Massive kills can occur when oil reaches the benthos in sufficient quantity. The only indication of a massive kill may be the remains of the dead organisms, but if they lack hard parts there will be little evidence. In spite of a massive intrusion of petroleum hydrocarbon pollutants from the Ixtoc I event into the study region of the South Texas Outer Continental Shelf during 1979-1980, no definitive damage can be associated with this or other known spillage events (e .g ., Burmah Agate ) on either the epibenthic commercial shrimp population (based on chemical evidence) or the benthic infaunal community. Such conclusions have no bearing on intertidal or littoral communities, which were not the subject of this study. ^ Marshall, Jessica (2010-06-01). "Gulf Oil Spill Not the Biggest Ever". Discovery News. Retrieved 2010-06-14. ^ a b John Charles Milne (2 Nov 2008). "Sedco 135 Series". OilCity. Archived from the original on 20 December 2008. Retrieved 20 May 2010. ^ a b Linda Garmon (25 October 1980). "Autopsy of an Oil Spill". Science News. 118 (17). pp. 267–270. ^ "Ixtoc 1 Oil Spill Economic Impact Study" (PDF). Bureau of Land Management. pp. 4–6. Retrieved 2010-05-06. ^ Robert Campbell (May 24, 2010). "BP's Gulf battle echoes monster '79 Mexico oil spill". Reuters. Retrieved 30 May 2010. 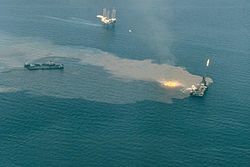 ^ "BP's Gulf battle echoes monster '79 Mexico oil spill". Reuters. 2010-05-24. Retrieved 2010-05-24. ^ a b c Jernelöv, Arne; Lindén, Olof (1981). "The Caribbean: Ixtoc I: A Case Study of the World's Largest Oil Spill". Ambio. Allen Press for the Royal Swedish Academy of Sciences. 10 (6): 299–306. JSTOR 4312725. ^ Glenn Garvin (2010-06-27). "After big 1979 spill, a stunning recovery". The News Observer. Archived from the original on 24 July 2010. Retrieved 14 July 2010. ^ Teal, John M.; Howarth, Robert W. (January 1984). "Oil spill studies: A review of ecological effects". Environmental Management. 8 (1): 27–43. doi:10.1007/BF01867871. Retrieved 14 July 2010. ^ ERCO/Energy Resources Co . Inc. (19 March 1982). "Ixtoc Oil Spill Assessment, Final Report, Executive Summary Prepared for the US Bureau of Land Management, Contract No. AA851-CTO-71" (.PDF). US Department of the Interior, Minerals Management Service Mission: 27. Retrieved 14 July 2010. This page is based on the Wikipedia article Ixtoc I oil spill; it is used under the Creative Commons Attribution-ShareAlike 3.0 Unported License (CC-BY-SA). You may redistribute it, verbatim or modified, providing that you comply with the terms of the CC-BY-SA.